Few breakthroughs in the history of turf have been as significant as the arrival of an entirely new kind of lawn—the sedge lawn. Sedges are close botanical cousins of the grasses and look a lot like them. Properly selected and planted, sedges can function as a traditional lawn, yet they require little or no mowing, fertilizing, or chemicals. Some require less water than many conventional turfgrasses. Others tolerate wet, moist areas, and many thrive in shade. What's more, sedge lawns restore something of the character of the native sods that existed before agriculture and development transformed the American landscape. Conventional lawns consist of grasses from Africa, Asia, Europe, and other places. These foreign, high-maintenance species have largely replaced the native sods composed of sedges and grasses. Today very little remains of the native sods. Perhaps the new American lawn is the original sod just waiting to be rediscovered. Sedge lawns are usually planted from plugs, as the seeds of many sedges are short lived and have low germination rates. The most important step in establishing a new sedge lawn is to start with weed-free soil. When converting an existing lawn, make absolutely sure the old lawn is dead (see "Planting a Native Grass Lawn Step by Step"). Top-dressing newly planted plugs is far more beneficial than incorporating mulch into the soil. Fertilize as you would a lawn to speed establishment. Mowings every month in the growing season will speed tillering and help the newly planted plugs to fill in. Part of the attraction of the genus Carex, into which sedges fall, is its tremendous variety and adaptability. There are more than 2,000 species of Carex, and they are found in a wide range of habitats in nature. They vary from miniatures with foliage only 1 to 2 inches high, to specimens growing to 3 or 4 feet. Some creep, some clump, some do a little of both. They can be found in sun or shade, in wet soils or heavy clay, from coastal dunes to alpine scree. In almost every ecosystem, there is at least one sedge with good, lawnlike qualities. Five sedges that have shown excellent promise as substitutes for traditional lawngrasses are catlin sedge (Carex texensis), Texas Hill Country sedge (C. perdentata), Baltimore sedge (C. senta), Pennsylvania sedge (C. pensylvanica), and California meadow sedge (C. pansa). These species are described below. These native sedges have been selected for their compact growth and good, green color; most are evergreen as well. Many will tolerate varying degrees of shade and competition from tree roots. They are best grown in the regions where they are native, although most have shown amazing adaptability and grow well in regions outside their native range. As more horticulturists become aware of the sedges' potential in gardens, many more species are being collected from remnant populations in nature. Hybridization is still untapped and offers enormous possibilities for lawns of the future. This wide-ranging sedge is found in nature from Texas through Ohio and has naturalized in parts of southern California. In nature, it hybridizes and mingles with closely related, similar species throughout the Southeast. Catlin sedge is adapted to a wide variety of climates, from the hot, muggy Southeast to the hot, dry Southwest. It is hardy to USDA Zone 6, and perhaps Zone 5 in sheltered locations. It forms a matlike clump 3 to 4 inches high and 6 inches wide. To maintain as a lawn, catlin sedge will require two to three mowings per year. This dark green sedge is at its best in partial to full shade. Planted in full sun, it will tend to be lighter green and require ample water to look its best. Catlin sedge makes a fine lawn mowed or unmowed, planted either from seed or from plugs 6 inches on center. This Texas native is another excellent lawnlike sedge. It is drought tolerant and moisture tolerant with surprisingly soft, medium-green foliage. Its slowly creeping, almost clump-forming foliage is a light green color growing 4 to 6 inches high. A very versatile sedge, C. perdentata grows equally well in sun or shade, heavy or sandy soils. Its evergreen foliage is dependably hardy to Zone 6 and possibly lower. It looks best when watered regularly, but like most sedges it will tolerate periods of summer drought. Plant from plugs 6 to 12 inches on center in fall or spring. Pennsylvania sedge has a wide distribution throughout the eastern and central U.S., with one form, C. pensylvanica var. pacificum, reaching all the way to Puget Sound in Washington state. With such a wide distribution in nature, this sedge and its hybrids hold much promise for natural lawns of the future. Many distinct and varied clones are being evaluated by nurseries throughout the country. Typically found on sandy soils in dappled shade or as a constituent of low prairies, Pennsylvania sedge can tolerate less than ideal conditions in the garden. Its noninvasive, creeping foliage forms dense mats of medium green, fine-textured foliage growing 6 to 8 inches unmowed. As a mowed lawn, this sedge looks best cut two to three times per year at 3 to 4 inches high. Plant Pennsylvania sedge from plugs 6 to 12 inches on center in fall or spring. This native Pacific Coast sedge is hands-down one of the finest native sedges for making natural lawns. Largely untested in the East, it has proven durable in Texas and Colorado. Slowly creeping, dark green foliage grows 4 to 6 inches unmowed. California meadow sedge will tolerate varied types of soil conditions and temperatures, from sandy, exposed seacoasts to heavy clays and hot, inland valleys. It is also exceptionally traffic tolerant. Thriving in full sun to partial shade, it will thin out in deep shade. Mowing two to three times per year keeps the foliage low, tight, and lawnlike. Unmowed, it makes an attractive meadow and remains evergreen in all but the coldest climates. California meadow sedge is fast to establish from plugs planted 6 to 12 inches on center. This native eastern sedge is essentially a refined version of catlin sedge—identical except for shorter flower spikes, which lend a neater, more lawnlike appearance when unmowed. Discovered originally by Briar Hoffman growing in the lawn of a church in Towson, Maryland, Baltimore sedge is one of the best low-growing, lawn-forming sedges for deep shade. Treat this sedge as you would C. texensis. Plant plugs 6 to 8 inches on center. Like all sedges, plugs of Baltimore sedge planted in spring or fall will establish quickly. John Greenlee , dubbed "The Grassman" by Wade Graham of The New Yorker, established Greenlee Nursery in 1985 and is the author of The Encyclopedia of Ornamental Grasses (Rodale Press, 1992). We are in Hackettstown, NJ and have a small pond. The pond is lower and the water pours out of the higher ground so it’s very wet. Due to sinking up to the ankle in mud, I need something to plant that needs no maintenance yet won’t invade the pond itself. It is a shaded area. I also would like something for around the edge of the pond that is low-growing and will also not move into the pond. Thanks for all your help. I’m in Northern Virginia, west of DC. Do you think Carex praegracilis would perform similarly to Carex pansa? I’m planting it in an area with sun and poor drainage. It seems Carex praegracilis is often mistakenly sold as Carex pansa. Thank you. Any recommendations for Boise, Idaho? I live near a dairy farm, so my soil is really good and I can grow pretty much anything. My backyard slopes quite a bit and was so difficult to mow that I covered all of the grass last year and killed it. Weeds were also a huge problem since I have neighbors on each side who seem to enjoy dandelions as much as I do pansies. I want to plant sedge in a shady oak tree lawn that has some erosion and is relatively steeply sloped. Have dogs but could keep them off plants until established. I live in Montgomery County, MD, and at the moment we have drought conditions with occasional downpours. Tree roots are a planting problem. We would like to plant in the fall with plugs. Any advice? Hello. I live in the Appalachian Mountains, northern Virginia, and I am trying to restore woodland and woodland edge habitat. I have found a small patch of sedges on a damp slope that is also overrun by reed canary grass and some other invasive species which I have yet to ID. What I’ve been doing in areas that are solely reed canary grass is applying cardboard and mulch to kill the grass before introducing sedges or grasses. In this area I don’t want to kill the sedges already present (mostly C. lurida, C. plantaginea and C. platyphylla) so I can’t completely eliminate the preexisting “weedy” grasses…do you have any recommendations for me? Thank you! Hi, Marian: According to the Minnesota Extension Service, Carex muskingumensis tolerates shade and moist/wet conditions. It also recommends several alternatives. Ask nurseries in your area what performs well in your conditions and climate. The Minnesota Horticultural Society also is a good resource. I live in central Minnesota. My husband and I would like to experiment with using sedge as a lawn in deep, moist shade. Do you have suggestions? Thank you. Can we overseed a Pennsylvania sedge lawn and how best to do it? We have a house on Chappaquiddick Island, which was formed by a glacial moraine. Our soil is sandy, claylike, and not particulary permeable. Pennsylvania sedge is native and we have it to varying degrees in both shade and sun. The soil is presumably low-ph as pines, choke cherry, oak, Rosa rugosa and blueberry are native and abundant. We have been nursing our sedge lawn for 30 years. It can not be practically irrigated, and we are reluctant to fertilize it. We are at 35 feet elevation and sloping toward a bay about 600 feet away. We would like to thicken the sedge and have it crowd out other less desirable plants such as dandelion and daisy and crabgrass. Your thoughts, please. We have sedge (unknown variety) in our lawn. In our flower beds too, to my dismay. It is in fact quite lovely, a very attractive shade of green, thick and lush, and mows well. I am delighted to hear that it is being recognized as a lawn alternative as we have no choice but to live with (and love) it. We are in eastern North Carolina (Zone 8), where we have some heavy rainy times and in late summer a severe period of drought. It seems to be more aggressive in full sun but is slowly spreading in the more shaded areas. I am hoping the sedge will continue to spread in barren areas under two magnificent oak trees where other grasses compete for water and nutrients, and where roots surface. We have been unsuccessful in getting any lawn cover in this area. Any ideas are welcome. Brittany: California meadow sedge should work pretty well, and in spots where the shade is too deep for it to fill in nicely, perhaps you could try as a groundcover yerba buena (Clinopodium douglasii). Thank you for the wonderful article. I’m trying to figure out what would do best in my very shady and wet (next to a creek) side yard in California. How about California meadow sedge (Carex pansa)? According to the California Native Plant Society, Festuca rubra (red fescue) or Carex pansa (dune sedge) can do well to create a low-water type of lawn. Given California’s current extreme drought situation, consider calling your local Extension office or the San Luis Obispo Botanic Garden (805-541-1400) to find out what up-to-date suggestions they have. I am searching for a lawn substitute in the Central Coast region of California.The climate is hot and dry in summer and winters with occasional rain and cold snaps of below freezing temperatures. The plot is a favorite play area for children under trees which cast dense shade. The soil is a silty clay loam susceptible to compaction. I have been reading about California Meadow Sedge, and understand that it needs sunny to partially shaded spots. Are there other sedges that might do better? Rachel: Regarding the sedge question in general, we think the sedges are a bit tall (often more than knee-high) for a dog run area. The groundcovers listed in our answer to Judy, above (May 31, 2013), would likely work better for you. Perhaps the easiest option is mulching with a permeable groundcover such as river rock (smooth and easier on your dog’s paws) or wood chips (easy to replace) and growing plants in large pots or other receptacles to create interesting aboveground plantings. Thank you for this informative article. We are living in Kentucky and have a 5 by 4 foot patch. The primary purpose of this future mini lawn is for our dog to relieve herself once/twice a day. Obviously, this small patch does not allow for much rest between uses, often killing the grass we’ve put down. Before turning to AstroTurf I thought I’d look into sedge. This area is zone 6, receives full to dappled shade, and is mostly clay. We are willing to dig 1.5ffeet down to add rocks and some green sand to create a bit more drainage. Considering the small size and the intended use, is there a sedge right for us? I am looking for a lawn replacement here in Tampa, Florida. We have several clumping and creeping sedges. I did have a good stand of Kyllinga brevifolia for a while, but this did not do well in the winter. Are there other commercially available creeping sedges that would do well in central Florida? C. laxiculmisis is a small, evergreen plant that prefers shade, although it can handle sun (one possible drawback is that this species likes moist soil and would need an adequate irrigation system); C. cherokeensis may also work for you. It grows 6 to12 inches tall and also needs moist soil; C. pennsylvanica, mentioned in the article above, is another choice. Sedges do not require mowing, but they may need a trim once or twice a year to clean up the previous year’s growth. Planting a Native Grass Lawn Step by Step has instructions on preparing the site and planting. For more information on plants native to New Jersey, visit the Native Plant Society of New Jersey’s website. I am looking for a native low-growing lawn alternative for my northwestern New Jersey home (up to six inches, part sun/shade). I am not allowed to mow the area. Do you have any suggestions? Thank you very much! Hi, Judy: Your yard presents a combination of challenges, not least of which is the site’s sandy soil and lack of irrigation. Consider installing an irrigation system, or at least sprinklers, for areas where you want to sustain lawn or other plants. Adding organic matter to the soil will help retain water and provide nutrients. The digging, running, urinating, and even lying around that dogs tend to do are also tough on growing things. Perhaps you could limit your dog to one part of the yard and plant in the other. Here are some ground covers that might do well in sun with some shade: lilyturf (Liriope muscari), mondo grass (Ophiopogon japonicas), woolly thyme (Thymus species), and Virginia creeper (Parthenocissus species). All are somewhat tolerant of salt and drought, grow in your hardiness zone, and aren’t listed as toxic to dogs on the ASPCA site (but you should certainly double-check this). Perhaps the easiest option is mulching with a permeable groundcover such as river rock (smooth and easier on your dog’s paws) or wood chips and growing your plants in large pots or other receptacles to create interesting aboveground plantings (which would still need to be watered several times per week). I am getting ready to plant sedge and at the same time I need a new lawn mower. I’m hoping not to use it soo much in the future so I was thinking a low end electric. Do I need a “bigger/better” one for cutting the sedge? We have a new yard around our remodeled home that’s full of that horrible red builder’s fill dirt. What do we do to plant a sedge and groundcover “lawn,” please (there’s some full sun, but it’s mostly under very tall trees). Thanks. Elect to do a “plant and seed source” search. Enter one of the Carex selections and search by common or scientific name to produce a list of nurseries to contact. John - I have your terrific book “The American Meadow Garden” and love it. But I don’t live in California and wonder which grasses/sedges would work in the Catskills in New York, zone 5? We have damp, clay soil and would like to convert it to a meadow garden. Which low-maintenance sedges would you suggest? We live in a grove of California Coastal Oaks on our property. We would like to plant the Sedge plant around and under the Oaks in our front yard. We live in Southern California inland. 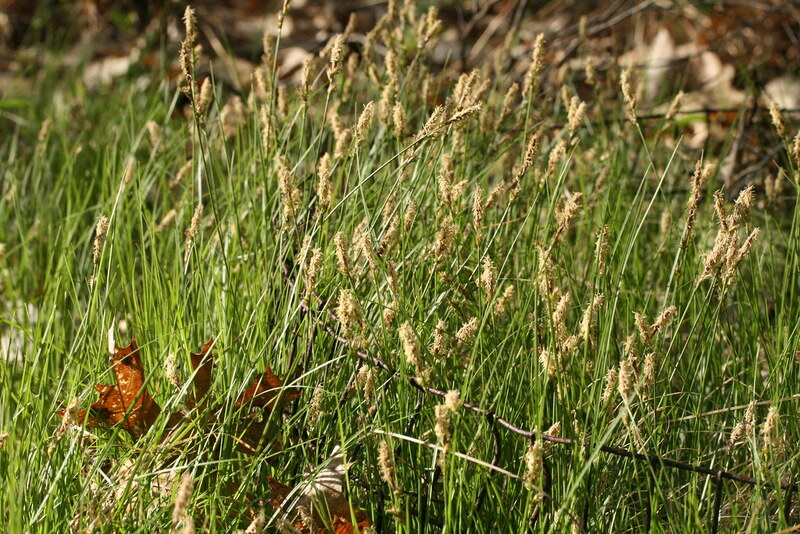 Can you tell us where we could purchase the California Meadow Sedge? Can’t wait to try this! Thanks!!! If I am planting in Pittsburgh, where can I buy it and how do i know how much to order?